Christmas is coming! Faster than we may want. Don’t take that the wrong way. I love Christmas. I love the season, the music, the decorations, the giving, the visiting, the food, the family get-togethers, the commercialization, the screaming spoiled kids…OK, maybe not the last two. But that’s the thing, right? It’s November 21; a little over a month to Christmas and it has already started. The stores have been decorated since November 12th (officially, decorating the day after Remembrance Day is the respectful thing to do). The commercials for kids toys, games, gadgets, you name it have been on the air since the beginning of November. And all that gives us is the “gimmies”. At one time, December 1st was the acceptable beginning to decorating, Christmas music, advertising, etc. Every year, I swear, it gets earlier. And every year, I struggle to teach my kids the real meaning of Christmas. We go to church, so they know the story. And we talk about it a lot. But when those commercials come on, the gimmies set in and they forget about all that Christmas really is. (Thankfully, at home anyway, they don’t see commercials because we subscribe to Kidoodle.tv and there’s no advertising; but I can’t control what they do at the babysitter’s or their friends’ houses). But kids love a good concept to wrap their minds around. And I think that’s where the Sparkle Box comes in. The Sparkle Box is a beautiful, silvery box that is accompanied by the story of a young boy named Sam. Sam is getting excited for Christmas and puzzling over a sparkly box that is sitting on his family’s mantel. Throughout the story, Sam’s family does kind things for others. They donate food and blankets to the homeless, Sam gives a new pair of mittens and a chocolate bar to a man he has seen sleeping on a park bench, and Sam’s father raises money to provide clean water to a village in Africa. And when Christmas morning comes with all of its excitement, Sam and his family open their Sparkle Box to reveal a special gift to Jesus on his birthday. This story is so touching and so heart-warming, I had a difficult time reading it to my children without tearing up. My husband sat with us the first time I read it to them and I’m sure he noticed how often I had to pause and focus on the pictures to regain my voice. When I could speak again, I took these moments to ask my children questions about the story and about nice things that they have done or could do for someone, and when we finished the book, I sensed that they had grasped the concept and the spirit of the Christmas story, the birth of Jesus, and what it stands for. If you’re looking for a Christmas gift for a child or for anyone who enjoys reading and the magic and spirit of Christmas, The Sparkle Box by Jill Hardie is a wonderfully written and beautifully illustrated book that comes with your very own Sparkle Box. I highly recommend it. The book’s tagline is “A Gift with the Power to Change Christmas”. I couldn’t agree more. Its simplicity is its power. It has become my favourite Christmas story. 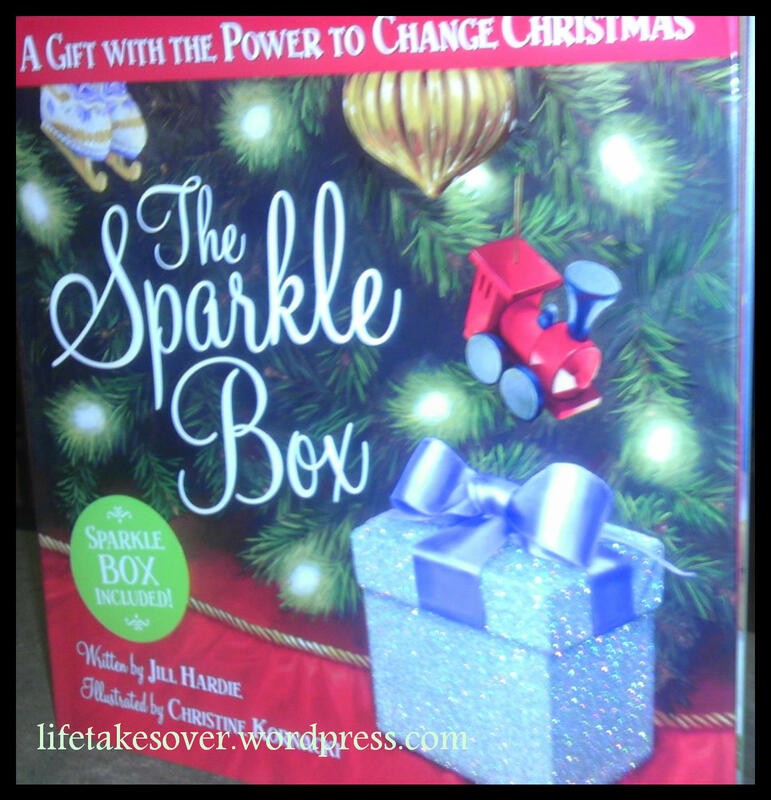 I received a review copy of The Sparkle Box. As always, the opinions above are my own. I received no other compensation for reviewing this book. This entry was posted in Uncategorized and tagged Betterment, caring, Christmas, Christmas story, faith, Faith, Family, giving, Holidays, Jesus, Kids, reading, Reviews & plugs, Sparkle Box, values on November 20, 2013 by Nancy.